G.Skill is pushing DDR4 memory to new heights yet again. This time they are releasing the fastest available Ripjaws 4 kit at a whopping 3666 MHz. The 16GB kit will be available in a 4X4GB arrangement and uses Samsung IC chips. It’s going to be fun watching just how high manufacturers can push DDR4 memory as time goes by, but you can be sure G.Skill will be at the forefront. Here is the press release we received today. Ripjaws 4 Series DDR4 3666MHz Memory kit! Taipei, Taiwan (12 May 2015) – G.SKILL International Enterprises Co., Ltd., the world’s leading manufacturer of extreme performance memory, proudly announces yet another extreme speed DDR4 memory kit to the market at a blistering 3666MHz with only 1.35V! This first-of-its-kind top speed memory kit features a 16GB (4GBx4) capacity and premium class Samsung 4Gb IC chips. Validated on the Gigabyte X99 SOC Champion motherboard, the Ripjaws 4 series DDR4-3666MHz memory kit takes the high end desktop X99 chipset platform to new heights in the exciting preparation for the upcoming DDR4 platform. 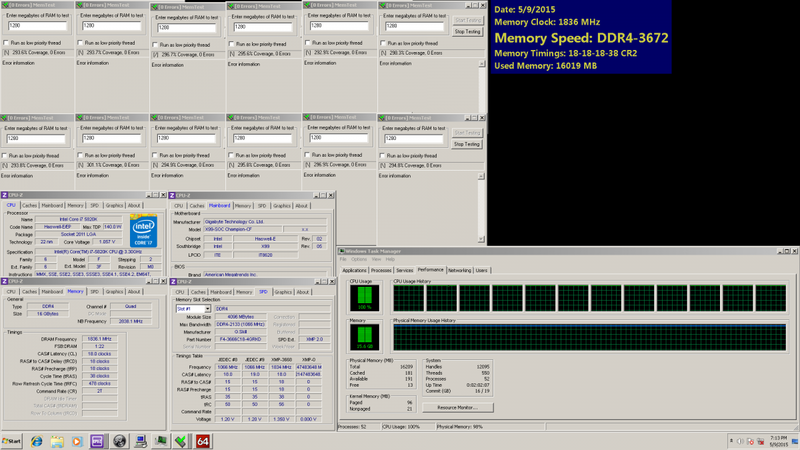 DDR4 memory has come a long way since its release nine months ago in August 2014. With this latest achievement at 3666MHz extreme memory speed, the full potential processing power of the Intel X99 platform can now be realized. Your ultimate gaming system or workstation can now run smoother than ever as you progress from level to level in-game or switching from workload to workload. This G.SKILL DDR4 3666MHz 16GB (4GBx4) memory kit comes with the latest Intel XMP 2.0 standard developed for the Intel X99 platform. It provides PC enthusiasts an entirely trouble-free overclocking experience to boost their systems for extreme levels of performance, while retaining system stability.